This is a specialised, but inclusive rhythm and dance program designed for those with individual learning differences and other special needs. You can read more here. Check out this video too! Our very own Tamsin was the first teacher in Australia to be certified as a Rhythm Works Instructor and she has been taking private lessons and small group classes with Preschool and Primary School aged children. Our Director, Megan is now also a fully certified Rhythm Works Instructor. 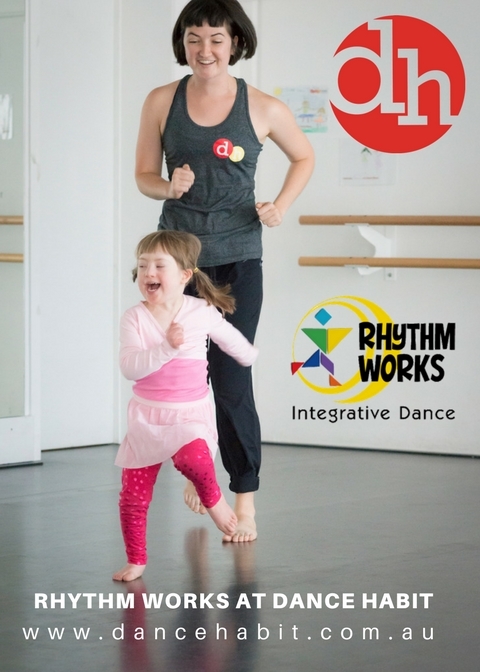 The Rhythm Works Platform is perfect for us here at Dance Habit because it has a focus on inclusion, which is one of our main priorities! If you are interested in the Rhythm Works Program for your child, please get in touch with us now. We’d love to welcome you to our community and share the benefits of dance with you and your family! “We were lucky enough to have Dance Habit provide Rhythm Works classes at Jennings Street School over a four-week program during our Physical Education sessions. The Rhythm Works program was well suited to our students who are on the autism spectrum. The program was well structured and age appropriate. Tammy was a brilliant instructor and the kids loved her. We look forward to offering Rhythm Works classes to more of our students in the future.” Stephanie Young, Physical Education Teacher, Jennings Street School.